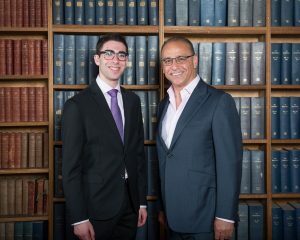 On the 7th June, Theo Paphitis was invited by the Oxford Union to have an 'In Conversation with...' evening, hosted by the Oxford Union President, Robert Harris (pictured with Theo below). Theo attended a drinks reception with evening ballot winners, before being interviewed by Robert. An intensive Question & Answer session followed the interview, with questions from academics and budding entrepreneurs alike. Topics including future business trends, the reliability of Wikipedia, social enterprise opportunities and how to best market a business were on the agenda and it was also a chance for Theo to discuss the upcoming EU Referendum in detail.